Subaru's U.S. demand is up and the automaker is having a hard time meeting that demand with the current production facilities. It was announced at a joint press conference between Subaru and Indiana Governor Mike Pence the the automaker will be expanding production capacity at the plant in Lafayette. The automaker plans to invest $140 million in order to expand yearly production by 100,000 vehicles at its only U.S. plant. This expansion is predicted to create 1,204 new jobs by 2017. This plant currently employs 3,800 workers pumping out 300,000 vehicles a year. This announcement comes after the automaker's CEO, Yasuyuki Yoshinaga, said that Subaru will begin production on a new 7-seat SUV plant in Lafayette. This new SUV will be sold exclusively in the American market. This plant currently produces the Subaru Outback and Legacy and also the Toyota Camry. Fuji Heavy Industries, which owns Subaru, said previously that it would halt Camry production at the plant, which has been building the sedan since 2007. Toyota has confirmed it will end Camry production will end in fall 2016 and shift output to its Georgetown, Ky., plant. The Camry's departure would free up capacity of 100,000 vehicles, on top of the additional 100,000 announced today. 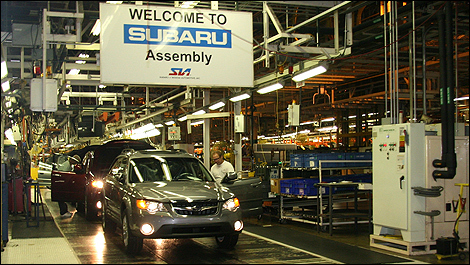 This is the second major investment in Subaru’s Indiana plant in recent years. The plant is undergoing a $400 million expansion, designed to allow Subaru to begin production of the Impreza model by the end of 2016. Pence met with Yoshinaga last week in Japan as part of a jobs mission. The Indiana Economic Development Corp. offered Subaru up to about $7.7 million in conditional tax credits and $250,000 in training grants, according to a news release. Subaru is predicted to gain a 7th year of record U.S. sales. In August, the automaker sold 52,697 vehicles in the United Stated-up an impressive 4.9 percent from 2014's August sales. This marked the 45th consecutive month of sales increase for Subaru. Subaru has sold 375,632 vehicles this year through August, up 13 percent through the same point in 2014. That puts it on pace to sell about 563,000 for the year, compared with 513,693 last year.